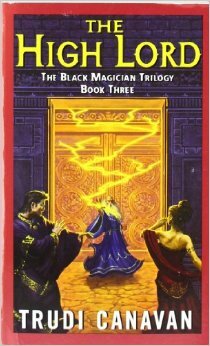 A mate of mine dropped me an email last week letting me know that I had sent her reviews of the Black Magicians’s Trilogy way back in 2009. These reviews actually predate the book club (I think) and will be posted under the email receipt date in a few weeks. Despite every impulse within me, I won’t be editing these reviews at all, except for basic tidy up to follow the usual LBC review format. I’ve even left in the infuriating oxford commas that I now avoid like the plague!! Sonea has learned much since she was but a penniless urchin possessing an awesome untapped ability. She has earned the grudging respect of her fellow novices and a place in theMagicians’ Guild. But there is much she wishes she had never learned—what she witnessed, for example, in the underground chamber of the mysterious High Lord Akkarin . . . and the knowledge that the Guild is being observed closely by an ancient fearsome enemy. Emailed to my friend on 6th January 2009. Wow O wow O wow…did this ever not end up in the place that I thought it was going to!! !The book that makes the trilogy – the best of all; the biggest of all and the finale. At times, this was an entirely frustrating read. For one thing, just as the whole school thing skips forward a year and gets interesting; it’s mixed with the wanderings of a not-entirely aimless wizard intent on digging up the past, specifically Akkarin’s. Well I have to read it again. I did a lot of speed reading and missed vital details along the way (though we never do find out about the third gem…never gets answered…love it).This book does so much – and like I said, its a biggie, but a goodie – for me I found that it divided into thirds. The first – Sonea IS learning more about the magicks and the High Lord. The second – working in the dark. the third…well, it is a fantasy novel – its the big reveal/fight/resolution.And romance. But not in a ‘oh-god-a-woman-writing-sci-fi/fantasy’ way. It’s understated and all the more poignant, romantic and satisfying for being so (though I have a slight ick factor with the whole ‘he was her teacher’ thing). And the ending…unforgettable.